Emma Thompson is keeping an eye on Pippi and Pepper, the two silver-laced wyandotte hens. Pippi and Pepper are pretty. Pippi and Pepper are mean. They rule the roost, but tyrannically, cruelly. They peck, they pull feathers, they torment, they are greedy and selfish, and calculating. 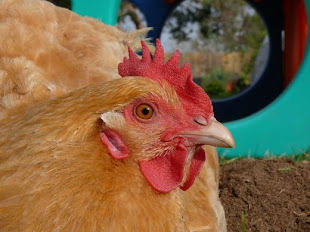 And they are particularly abusive of my dear Mako, who is a mild and sociable hen. Pecking orders, and being hen-pecked... these are natural aspects of chicken life and I've seen enough flocks and known enough hens and roosters to know what's up. However, some hens can rule a roost with grace and discipline, with intelligence, mercy, decorum. I've kept roosters who gave their all for their flock, without overstepping their authority. A mean hen, or rooster, spoils the fun. Be certain, you mean hens, that I have got both eyes on you, too. No one is interested in enduring your fiendish ways, and sharp beaks. Ah, the harsh realities of life play out no matter the species, it seems. Sad, but true. And still, when those bullies go low, we go high!